Several flooring trends that have developed in the past year or so remain strong with little indication they’re losing popularity. 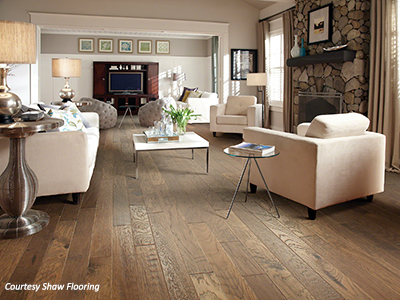 Hardwoods, of course, remain popular due to their warmth, durability, and variability. But there’s also more interest in tile and luxury vinyl tile which, thanks to technology today, can look like anything you please. Tile manufacturers have offered wood-look tiles and vinyl for a while now, and experts say that textures will be leading the way this year—think flooring that emulates linen, tweed, and similar textures. Although some predicted that grey flooring tones would not have staying power, homeowners and designers are proving them wrong. The popularity of grey as a new classic color can be found in all flooring materials, and may in part explain the continued interest in concrete floors in urban-look homes. Recognized by designers as a classic neutral rather than a passing fad, this color fascination is tied to a beloved aesthetic of history and time gone by, according to Leah Gross of the World Floor Covering Association. “Gray connotes an air of permanence, the allure of age. It is vintage, weathered, reclaimed. Reclaimed flooring—or flooring that mimics that look—has a story to tell resonates with homeowners of today. The soothing grey tones, often combined with wider wood planks, have become a staple in many modern homes. Matte and low sheen finishes have also shown increased popularity as they hide minor wear and tear without a devotion to cleaning. Experts say dark and blonde floors will remain popular, but that gray is at the forefront. 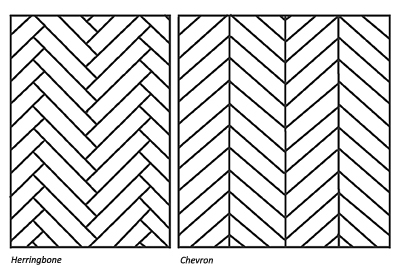 Popular in urban settings are chevron patterns. 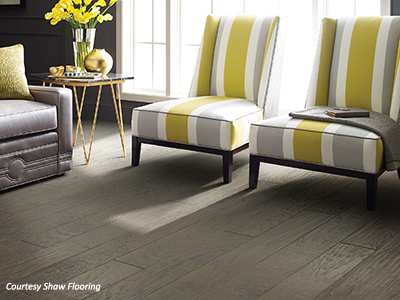 Parquet, which passed out of favor years ago, was created from small squares of hardwood strips. Today, herringbone (a zig-zag look in which square-cut edges are woven together) has been surpassed by chevron patterns in which wood pieces are cut on an angle and married together. 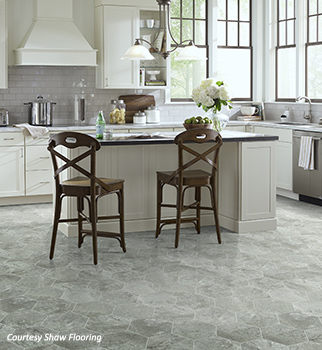 To capture the best of both worlds—easy maintenance and installation with the look of tile—manufacturers of resilient vinyl flooring have created tiles that are designed to be grouted for the look of realism. 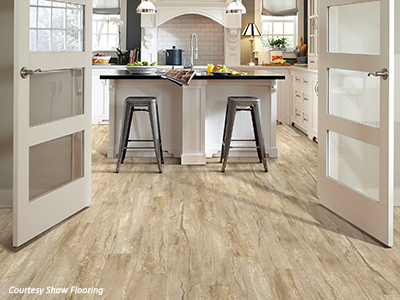 Much of the new vinyl flooring is also very durable and stands up to even the toughest tests of a busy family’s lifestyle. Many designs have an enhanced surface layer to prevent scuffing and scratching and an added backing layer to prevent rips, tears, and gouges. Homeowners are turning away from neutral, white, and cool-toned tiles as they favor warmer-toned tiles to brighten living spaces. Warm-toned, natural, and matte finish materials such as terracotta are the among popular choices for tiled floors in 2017. Warm toned tiles are rustic and classic, adding a character and warmth to interiors. Also part of the trend to bring mother nature closer is the intermingling of contrasting materials such as wood and tile. Though not possible with the “real thing” due to wood’s inherent tendency to expand and contract, the pairing of wood and stone looks in porcelain creates a stunning effect, says Gross. Likewise, a worn, distressed rug laid down over sleek, matte concrete floors adds unexpected rawness and drama to an interior. In spaces clamoring for carpet, flooring experts say natural tones and textures will continue to trend this year, as homeowners and designers remain enthusiastic about integrating the natural and built environments. Soft, muted natural tones utilizing sustainable fibers in durable, easy-to-clean carpet will continue in popularity. The new look steers away from shags and friezes and offers patterns with layered color and soft texture and lots of dimensions. Using a technique that combines both loops and sheared fibers (loop and cut), manufacturers have created a carpet with 3D effects with multiple heights and colors ranging from subtle to bold, according to Gross. As part of the movement, more carpets and rugs in dense florals and overgrown and creeping foliage are seen in indigoes, petrol, dark purples, greens, lilacs, and wine tones. Other new carpets offer sculpted surfaces like sand dunes and tree bark, or rugs that convey marine-like watery effects.